Gressco is pleased to be the exclusive distributor of HABA children’s furniture in the United States and Canada. As one of the world’s leading children’s furniture manufacturers, the Habermaas Company of Germany has been creating hand-made furniture for more than 60 years. Custom finishes are not available on HABA products. 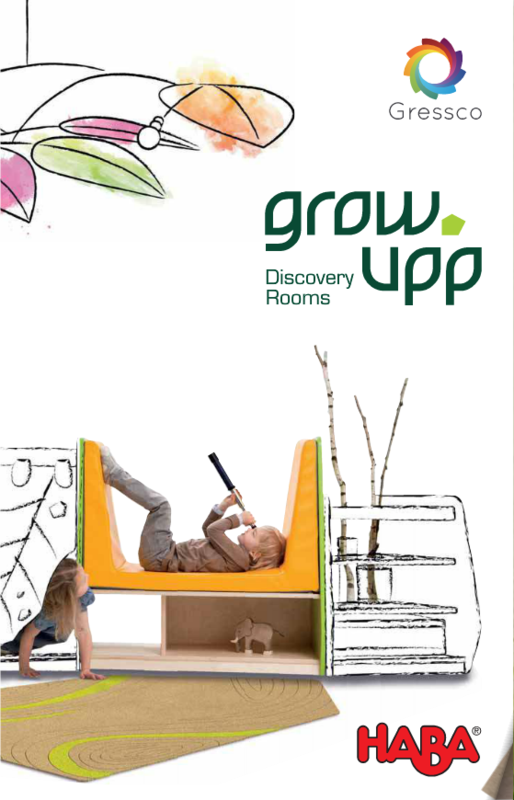 Grow.upp Branches Picture and Art Line by HABA. Line approximately 87 1/2" L, branches 17 1/2" H. Ten year warranty. Made in Germany. There's plenty of space between the branches to hang beautiful pictures or art. Multi-Play Tower by HABA. W 23 3/4" x H 47 1/4" x D 23 3/4". Ten year warranty. Made in Germany. A variety of game stimuli for multiple children of different ages. The options range from sliding, jumping, assignment and motor skill games to "The Orchard" cooperative game with the little raven for up to 4 children. W 47 3/4" x D 43 1/2". Ten year warranty. Made in Germany. W 67 3/4" x D 48 1/4". Ten year warranty. Made in Germany. Grow.upp Seating Circle Carpet by HABA. 98 ½" L x 102 ½" W. Ten year warranty. Made in Germany. Perfect for creating a seating circle where children can sit on their favorite color.